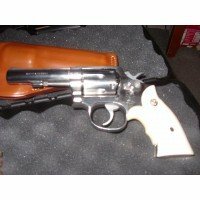 HandgunSturm, Ruger, & Co., Inc.BlueSingle.44 special5.56(2) Walnut & Ivory compositAdjustable45 oz. Trigger: Pull Weight: 3 lbs., 2 ozs. Metal Finish: blued comes with Ruger holster and suede carrying case. Ruger’s trim and handsome .44 Special Flattop Blackhawk is a near ideal combination of power and packability for the trail.